Wwiithin an hour we were docking at Bonn, Germany's soon-to-be-erstwhile capital city, situated just 15 miles south of Koln on the Rhine. A number of passengers boarded here and the vessel got quite full. The ultramodern Bundeshaus buildings which houses the federal assembly hall, edges the Rhine at Bonn. The Rhine virtually bisects Bonn by half as the city is built along both sides of the river. The most prominent landmark of Bonn and also of the Rhine valley is tall the five-towered Romanesque cathedral. The boat puttered out of Bonn further south, past the basalt hills of the Siebengebirge rising east of the river at Andernach. Andernach sprung up on the banks in 12 BC as the Roman garrisontown of Antunnacum. The scenery here has found utterance in Lord Byron's poetry, "...the castle crag of Dachenfels frowns o'er the wide and winding Rhine." Further south the barren, moor mantled uplands of the volcanic Eiffel and the Westerwald hills border the river. On board it was possible to purchase a few snacks, wine, good strong coffee, soft drinks and a map of the Rhine sights from the mini bar for just a few marks. However, their repertoire is not much more extensive than this. As the boat approaches Koblenz, the scenery gets more spectacular by the minute. This is the "heroic Rhine" of everyone's dreams. Our boat passes dozens of curious riverside villages. (Click on the top picture to get a better view) Since most of these towns were founded as early as the second century, the old fashioned buildings and cottages are vintage stuff and make great camera frames. More interesting is the fact that at each bend in the river, perched high on the bluffs are the most exquisite castles and fortresses. Most are leftovers from the middle ages and one can imagine the grandeur of their interiors from a distance. Some are crumbled down and others in marvellous shape. To examine them more closely is where the binoculars are handy. At noon we pulled into Koblenz. It is a delightful town, cheerful and full of character. Standing in the middle of the confluence of the Moselle and the Rhine is an impressive looking statue, the Mahnmal der Deutschen Enheit (Monument of German Unity). Built in 1897 in honour of Kaiser Wilhelm I, it is actually located on the Deutsches Eck (German Corner) peninsula which juts into the river. The German Corner is the focal point of the city. It is said when the Teutonic Order of Knights settled on this peninsula in 1216, the German nation was born over here. Just barely visible from the boat are the gorgeous towers and spires of the restored churches of the Alstadt (old part of town). Koblenz's Roman name was once Confluentes, primarily because of its strategic position on the junction of the Rhine and the Moselle. It was founded by the Romans in 9 BC. Past Koblenz, you most certainly enter the wine country. The entire banks of the Rhine is crisscrossed and blanketed with vineyards. Some are small postage stamp size vineyards, tumbling steeply down to the water. Others, vast terraced empires. The name of the vineyard and the wine is clearly written into the hillside, no matter how small the establishment. 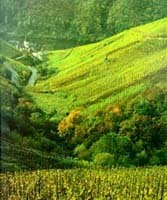 Wines, I read in my guide book are place names and "the more narrowly the terrain is defined the sounder the basis for advance judgement of the product. A truly meritorious wine will specify both the vineyard of origin and the year of vintage." 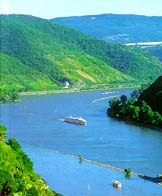 As we cruise towards Bingen, we are surely on the most splendid and romantic stretch of the river - the Rhine of legend and myth. To the right are the steep slate covered slopes of the Hunsruck range and on the left the hills of Taunus. The number of intriguing schlosser that dot the cliffs are breathtaking. We pause for a few minutes at Sankt Goar and its twin town, Sankt Goarhausen, just 480 feet across the river. These are typical pretty German stadt. The river bed is no longer flat and wide and the river now flows through a deep and narrow gorge. The traffic on the river is surprising. Boats apparently carry heavy loads of timber, potash, steel, iron, petroleum, grain and coal. More astonishing is the number of Swiss and French boats. And one pauses to consider that this river pathway to Basel could be the cheapest way to send goods to landlocked Switzerland. A fellow passenger, a South African doing water management research in Johannesburg, tells me he has read this is an important transit route for the Swiss. "Since the Rhine travels along the French and German border for a number of miles but never actually visits French territory, the Germans crib that the French just about dump anything they feel like in the river because it gets washed away to Germany!" he adds. 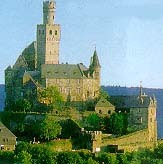 Just before Bingen, we pass the lovely castle of Kaub, located on an island in the middle of the river. We arrive at Bingen, an established wine centre of the valley. Located in the town of Bingen is the dramatic Mauseturm or Mouse Tower at water level.It is said in 913 AD, Archbishop Hatto I of Mainz was nibbled to death by mice in this tower for rascality. Hardly a few miles out of Bingen is Rudesheimam Rhein, a town famous for its brandy and the German champagne, Sekt. Located at the foot of Taunus range, Rudesheimam appears to be an antediluvian settlement of timber houses, narrow streets and old inns. The Germania monument that commemorates the founding of the German empire in 1871, presides over the vicinity from its hilltop perch. It is two o'clock, we are now approaching the town of Mainz. Once known as Mayence to the French. Mainz, it has over the centuries switched hands between the Germans and the French and has a mixed heritage, until all this was wiped out when it was razed to the ground after World War II. At Mainz, my cruise sadly ended. However the Rhine is navigable right up to Lake Constance, or Bodensee in Switzerland beyond Basel. Upstream, the river forms a border between Germany and France for many miles, and later between Switzerland and Germany and then Austria and Liechtenstein too. From the point of its origination as two head streams in the Swiss Alps to where it empties in the North Sea, the Rhine flows 820 long miles. Journeying from Koln to Mainz, I covered just about 100 miles of those 820 miles. Next year, the more adventurous thing to do would be taking a summer cruise from Basel to Rotterdam. So watch this space.